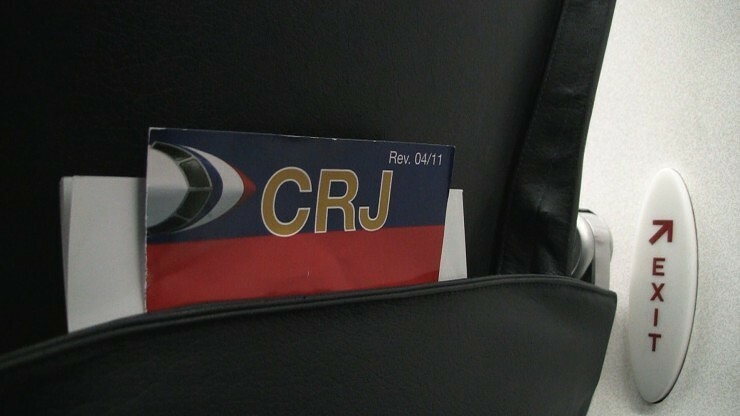 The slender, head-friendly economy seat aboard an American Airlines CRJ-700. Flights (and have premeire status) bulkhead row Row 5 might be the smarter choice as it may still have room for your knees and is closer to the front exit. Sadly, there was no wi-fi or onboard entertainment other than what was on our own devices. Be sure to charge up before the flight. Food: As on all domestic American Airlines Flights, complimentary non-alcoholic beverages are available but you’ll have to shell out a few buck each for grown-up drinks. One thing that’s consistent…All the coffee you can drink on all American Airlines Flights. Service: We got a fairly pleasant crew on this one. Service on our American Airlines flights in recent months had been spotty so it was nice to see that this was a genuinely happy bunch…or it at least appeared that way. How we got em’: Stuck in Toronto (long story) we had to buy tickets outright AT the airport. American Airlines flights were available and would have us back home in New York that night…but as soon as we booked the last one out, it was cancelled. Knowing we had a better chance of getting out of Chicago the following morning we hopped the last flight to O’Hare with a connection to Newark (EWR) in the morning. Someone took our non-elite seat in row 9, so we just slid into the exit row. Pure luck.